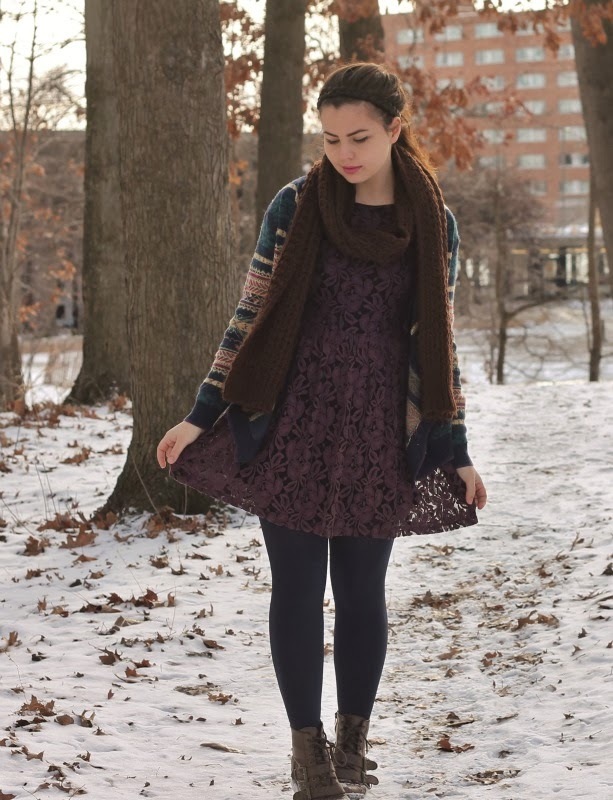 Lace Dress, Brown Chunky Scarf: Forever21. Lipstick in Wet N Wild's Mauve Outta Here. Something I've really been struggling with lately is trying to find housing for next spring. Since I'll be gone the first part of the school year in the fall, it makes things difficult to get any place to stay for only half a year; especially the second half. On top of that, it's hard to find roommates because, of course, no one wants to have to pay the extra for rent with me not being there for the first semester and I don't blame them. I had something in the works with a few girls, but unfortunately plans fell through this past weekend and now I'm left on my own trying to find a place. It's stressful and I'm sort of at a loss of what to do. Firstly, I feel just like a complete and utter loser to have no one to be roommates with. It makes me feel unwanted and like such a loner, and although I know I'll get along just fine being by myself I wanted a roommate(s) to help me get out of my social comfort zone. Secondly, everything for one person is so expensive and not to mention it's hard to find some place that will house me only half a year since leases are usually for a full year. My parents are coming up this weekend to go tour some places with me and hopefully I can find a potential apartment. Despite all of this hardship and worry I've been going through to find a place to stay, I am confident in God that He will find a place for me. I really am. I was thinking about how Jesus and His disciples had NO CLUE where they were going to stay as they went from town to town spreading the word. They had nothing and no one, yet they still made it through and God helped them. I'm trying to apply this to my housing situation and know that it's truly in God's hands and that I give it all up to Him. i hope you are able to find housing! you look very pretty in this post! I totally know how it is with college housing. I hope all works out. I really do love your outfit. That sweater is really adorable. This is one of my favorite posts of yours ~ God WILL take care of you and I know that He has great plans for you! By the way, you look radiant - so healthy and happy, and your face is absolutely stunningly gorgeous! I love your style and your blog. Keep it up, I'll pray for you too as you house hunt! Best of luck. I love your outfit, Lauren! The scarf with the cozy cardigan isn't anything I've ever thought of- genius! I'll be trying it soon! I'm confident God will provide for you! I know it's a tough situation you're in but just hang in there. On a style note, you look ravishing in this darker color palette! 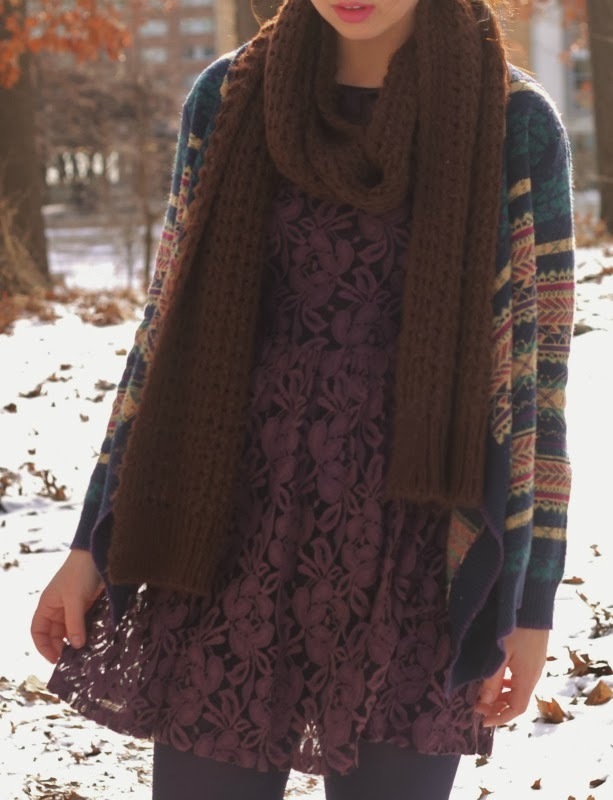 That dress & cardigan are an unexpected pair but they totally work! I really love the colors of this outfit. They look gorgeous on you. Maybe you can get a room and sublet it while you're studying abroad? Another reader posted this idea, but I had the same problem my junior year of college and did exactly what Hilary said to do: a friend studied abroad in the fall, and when she returned, she took my place in the dorm apartment and I studied abroad in the spring. It worked perfectly except for one thing: she was a good friend and I didn't get to see her for a year! :-) You should post on your college board and look for someone to switch places with. As for the outfit, of course I totally adore it. That dress is stunning is style and color and those tights are fantastic. That shot of them totally made me night. I look forward to your post SO much and you never disappoint. You are the best :) (and, oh yeah, by the way, so freaking lovely). Am still shy but feeling more confident. 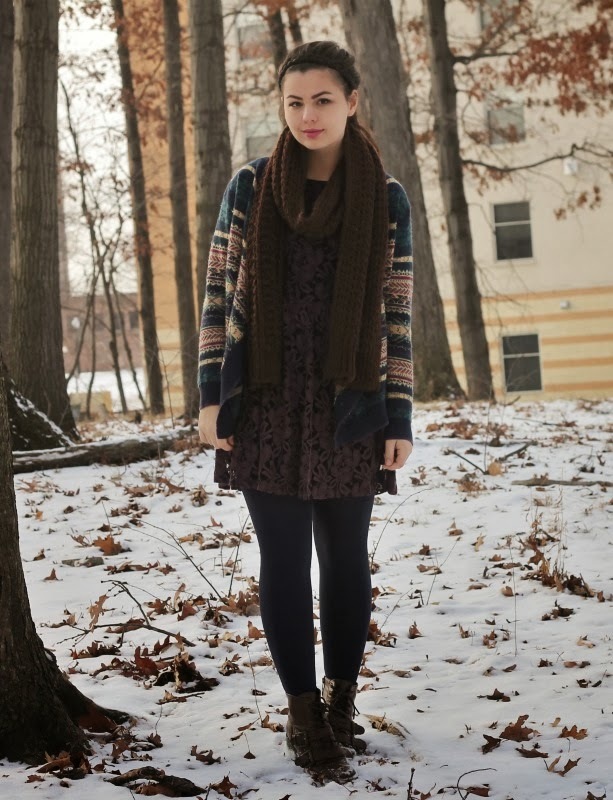 This is a lovely outfit, and I am in love with that cardigan! It's good to know that you are confident that God will take care of you. He WILL provide all of your needs. I'm loving this color combo and goodness gravy, I know exactly what you mean! I am currently going through the same process of figuring out rooming situations for next year. I love the application of the disciples and following Jesus even when they had NO clue what was in store for them. Reminds us that we have to live by faith and not by sight. Thankful for you and your blog! The colors in this outfit are simply breathtaking. so perfect for winter, and they look so nice with your complexion and hair. I really love the colour of the lace dress. It is looks really luxurious, and everything you are wearing compliments it very well. I am sorry to hear that house hunting isnt going well. It is always a tricky time, and I had a bit of a nightmare with it in my second year. There are always people advertising for house mates though. Trying looking for asks on the college facebook page where people are looking for someone. And then go for a coffee with them before looking at houses to decide if you are right for each other. Make sure you optimize your video clips for the various search engines. tutorials Retour non plus key code generators for grand theft auto 4. Custom made - Most closet organizers are custom made to fit the existing closet, cupboard or storage unit. that can be two-a-penny if the lodging's encumber cite. This can sustain it surrounding to the tract adornment can be more self-employed person. If you do experience to, exclusively to visitors quick flush it.